I rarely cooked any rasam though I love all southern flavors that I can rustle up. I have been planning to make my own rasam powder for ages but somehow kept postponing it, adding this curry patta powder to a thinned leftover daal was my idea of a quick rasam soup whenever required. Never have been a stickler to authenticity when the purpose is to get a tasty healthy every day kind of meal. But this rasam came to me on it's own. A very special rasam I would say. Ruchira Hoon who recently relocated to another country, brought this rasam powder (a few more powders and many many more gifts too) for me one of those days before she left. I was pleased to have this rasam powder with me, the other gifts will be cherished for ever but that is another story. 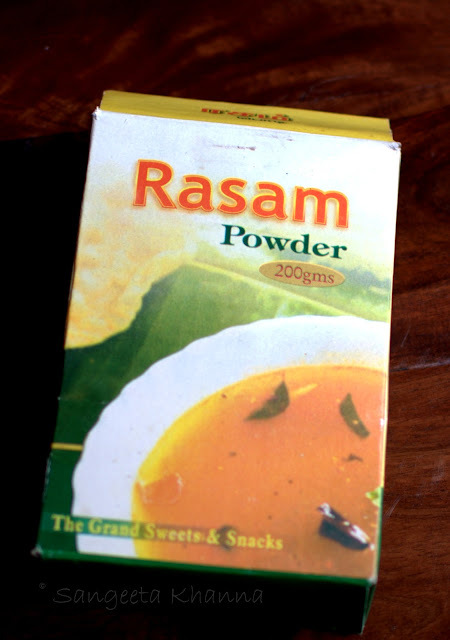 The rasam powder is by The Grand Sweets and Snacks (Chennai) and I wanted to try it sometime for the curiosity of tasting an authentic rasam powder. I would like to tell you that I am strongly averse to any packaged powder spices and make all my spice blends at home. This one stumped me. So two days ago when I was feeling hungry a little before dinner time and the husband wanted to skip dinner for some reason, I started thinking what I can cook for myself. As I got up from the work desk, I realised I have been having an itchy throat throughout the day and just been ignoring it. Some talks of rasam we had had recently was on my mind and it came back to me at that moment. There I fished out 2 large ripe tomatoes and cooked a cure for myself within 10 minutes. Sipped it with utter delight and sent across blessings to this girl. You got me hooked to rasam Ruchira. The best rasam soup I had in my life. Heat the oil in a pan and tip in the chopped garlic and curry leaves. Wait for a few seconds till the garlic gets aromatic and tip in the chopped tomatoes. Add salt, mix well and cook for 5 minutes covered on medium flame. No water would be required if the tomatoes are juicy, else add minimal water. Take off heat once the tomatoes are pulped. Liquidize the mixture in food processor or mixie or using a hand held stick blender, whatever suitable for the quantity you are cooking. Cooling the mixture will be advisable if making larger quantities, or just add a few ice cubes to quickly cool it and then liquidize. Return to the pan, add water to dilute it to make a soup consistency and add the rasam powder, mix well. Simmer for 2-3 minutes (do not boil the rasam after adding rasam powder, I read somewhere) and serve hot. These soup mugs hold about 400 ml liquid and I had 2 cups full of this rasam that evening. And my itchy throat was better. Almost cured. Blessed Ruchira lots that day, not that I don't bless her otherwise. She is adorable. Most interesting thing happened the next morning. The husband told me he felt itchiness in the throat too as he finished his morning tea. I suggested this rasam for breakfast, expecting he would shrink his nose. Who has rasam for breakfast other than moi? I was surprised to hear a yes. I was glad too secretly as I would get to have the rasam once again. Cooked the same recipe with added ginger this time to make sure the throat gets relief. And as he denied having anything else for breakfast, I thought of making him eat something filling as well. I scrambled eggs with the rasam, yes I did and it was awesome. To scramble eggs with this tomato rasam, empty the pan in which you simmered the rasam, reserving about 1/2 cup of rasam in the pan. Now break 3-4 eggs in it, add a bit of salt if required and scramble to cook the eggs. The watery liquid will be released once the eggs are completely scrambled. Empty the scrambled eggs in a serving bowl and pour the cooked rasam (that you already emptied from the pan before scrambling the eggs) over it. See how everyone loves it. 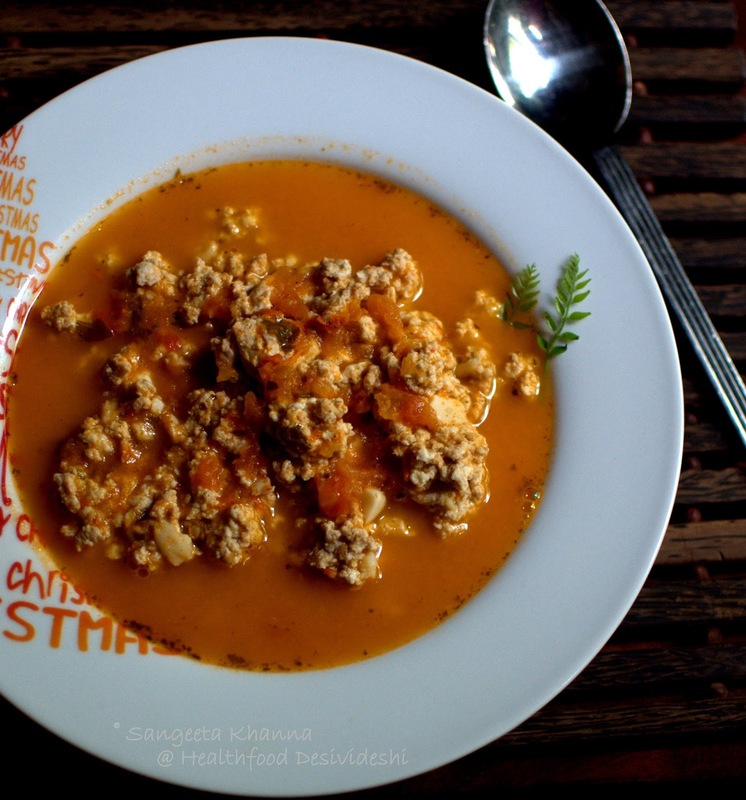 The husband asked for more egg scramble in this tomato rasam in the evening saying he needs one more serving of this to treat his throat. I know he loved it. I enjoyed my favorite flavors too. 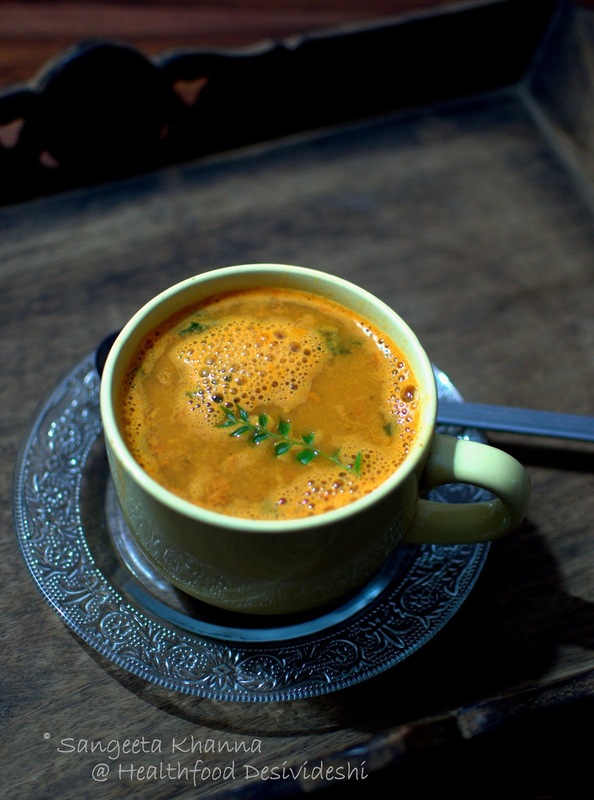 Sesame oil does impart a nice flavor to this tomato rasam and try and not skip it. The rasam powder includes, pepper, asafoetida, coriander powder, chilly powder and some lentil powder so the flavors are really complex but very soothing if you have a cold. 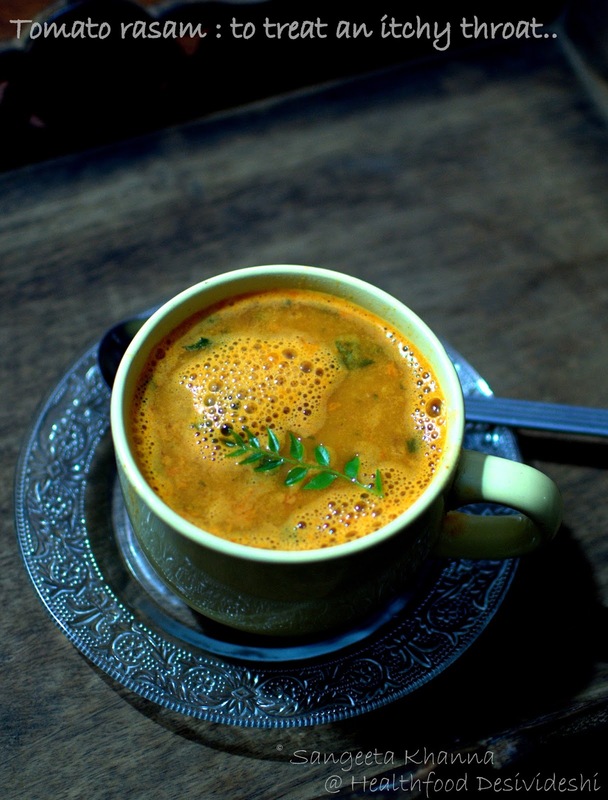 I can imagine having this rasam soup in the winter months. May be I'll make some rasam powder of my own by then. 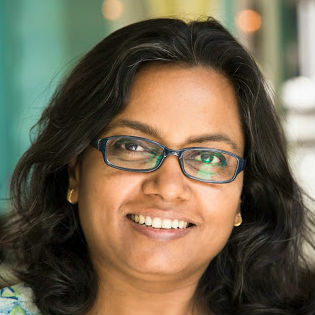 All thanks to Ruchira. How much I have been remembering you girl. Come back really soon. The rasam is awesome. It definitely works wonders on itchy throats. Love the clicks. Who could have thought of scrambled eggs and rasam.....would try this version sometime !! Thank you Abhiksha. I love eggs in any possible way, so easy to work with them. You entice me to make rasam...now to find this particular brand. Looks yum, and sound even better! This is what friends are for! !